What is a W-9 ? 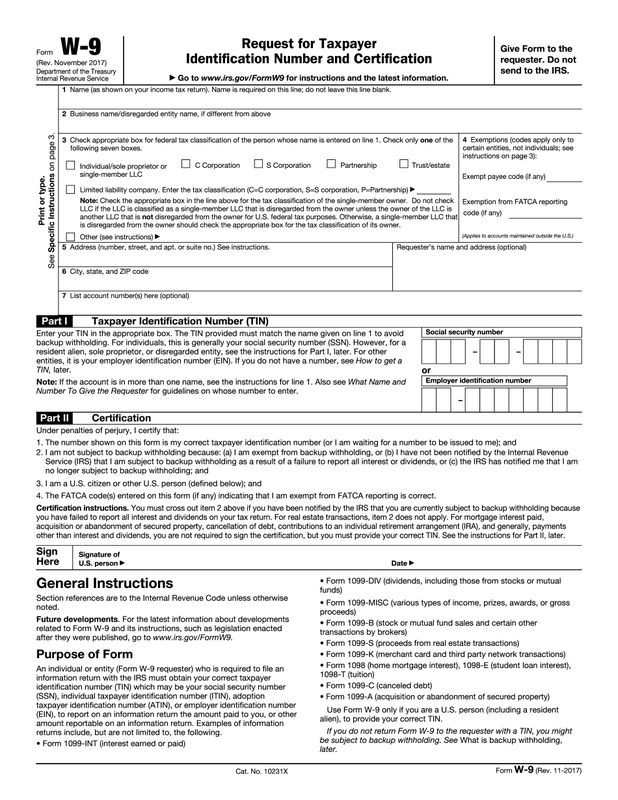 This form is usually used to pay taxes by freelancers, self-employed, or the individuals who have their own company or LLC. It is obligatory to complete a form W9 in order to avoid the payments withholding. Your income requires taxation only when you get more than six hundred dollars per year. The employer and banks may request you to provide the paper in order to make their reports about payments. Do not worry when contractor requires from you such document. The company needs it for making 1099 MICS. The taxpayer should not withhold this procedure, as he can get a penalty. How to fill out a W-9? include your contact information, date and signature. Read all the instructions that are given in the additional part of the paper very carefully. Check all the indicated information several times (especially numbers) to avoid mistakes. Make a backup copy not to repeat the procedure one more time. What’s the Current W-9 FormVersion? Actually, the template remains the same. You need to submit the one if the information you provided before changed. It can be the change in your name or surname but it is not necessary to insert your new address there. One more case is when you get another type of employment or receive employer identification number instead of taxpayer identification number (TIN). Thus, the changes depend on the situation. How to Send a W-9 2018 Online? Once you have submitted a form, you will have to download the blank and print it, or use the function “Send via USPS”. In the first case, you can print the whole sample or the fields with information only (if you have the special blank it should be printed at). Or you can use the feature that is available when you finish the sample. Click at “Send via USPS” option. You will be redirected to the page where you will be asked to fill in the empty fields on the envelope to specify the receiver and sender of the letter. Pay attention to the fact, that the institution you have to send the form is not IRS. Address the letter with W9 blank to the institution, that required it from you. How to Sign Form W-9 Online? In the bottom part of the electronic document, you will see the signature field. Click on it and select one of the proposed options of identification. You may draw the signature using your mouse or touchpad, type it, or upload its image. Additionally, it can be created with the help of your smartphone. To do that, send the link to your phone using e-mail or SMS and draw it on the touchscreen of your device.